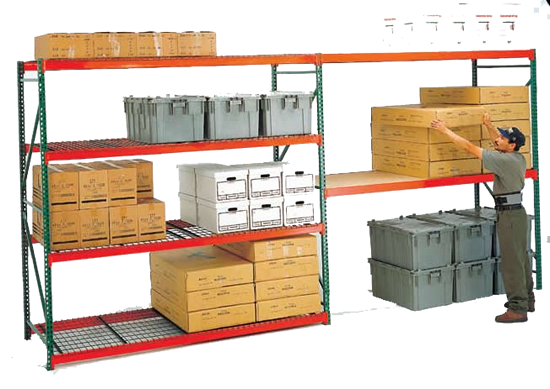 Save time and money with this heavy duty bulk storage shelving. 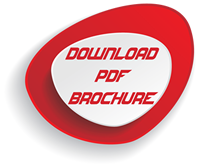 Featuring a newly designed heavier duty upright that can be “knocked down” for easier shipment as well as having the advantage of component replacement in case of damage. 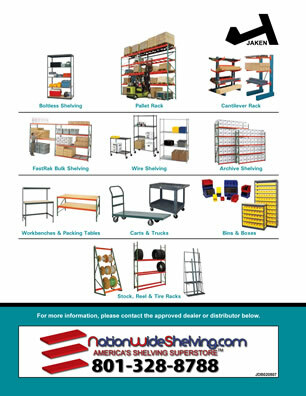 Ideal for storing bulky and/or heavy items. 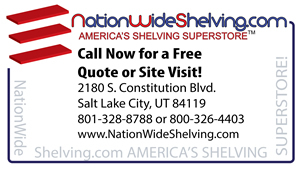 Choose between wire mesh or particle board decking for shelf surface. Secures the beam to upright for added safety. 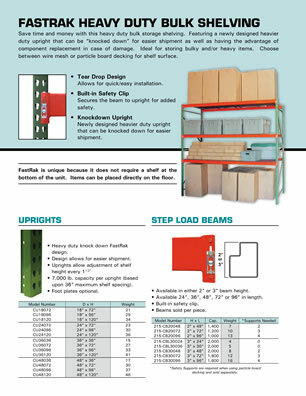 Newly designed heavier duty upright that can be knocked down for easier shipment. 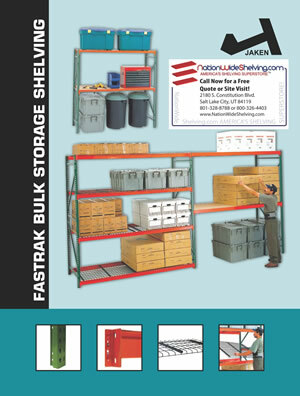 FastRak is unique because it does not require a shelf at the bottom of the unit. Items can be placed directly on the floor. Heavy duty knock down FastRak design. Design allows for easier shipment. Uprights allow adjustment of shelf height every 11/2”. 7,000 lb. 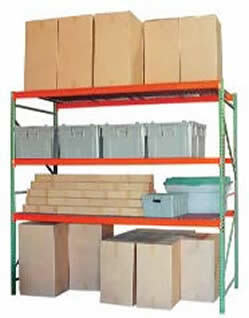 capacity per upright (based upon 36” maximum shelf spacing). Available in either 2” or 3” beam height. Available 24”, 36”, 48”, 72” or 96” in length. 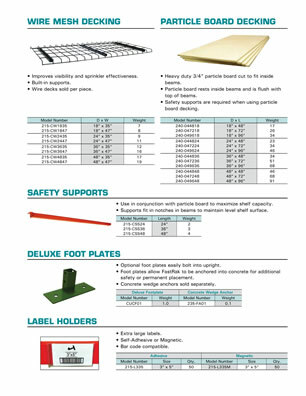 *Safety Supports are required when using particle board decking and sold separately. Improves visibility and sprinkler effectiveness. 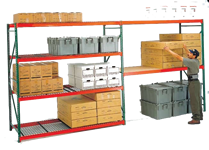 Wire decks sold per piece. Heavy duty 3/4” particle board cut to fit inside beams. Particle board rests inside beams and is flush with top of beams. Safety supports are required when using particle board decking. 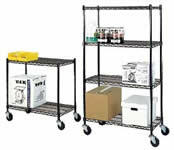 Use in conjunction with particle board to maximize shelf capacity. Supports fit in notches in beams to maintain level shelf surface. Optional foot plates easily bolt into upright. Foot plates allow FastRak to be anchored into concrete for additional safety or permanent placement. Concrete wedge anchors sold separately.